I had two small finishes this week. They'll be featured on the blog soon. I turned my improv curves from last week into my Disney Mug Rug and shipped off my swap package this week. Once I get confirmation that my partner has received it, I'll share it with you. My daughter and I finally sat down to put the binding on her doll quilt. It's all done and ready to deliver. She's so pleased. Today I got the report that at school she said, "I just want to sew and sew and sew." I totally know what you mean, kid! I have a goal to finish this one by the end of the month. I thought I had nearly all the blocks complete and just had to trim them up and stitch them together. When I opened the box with less than two weeks left in the month, I found I only have 92 complete blocks out of my planned 144! Eek! 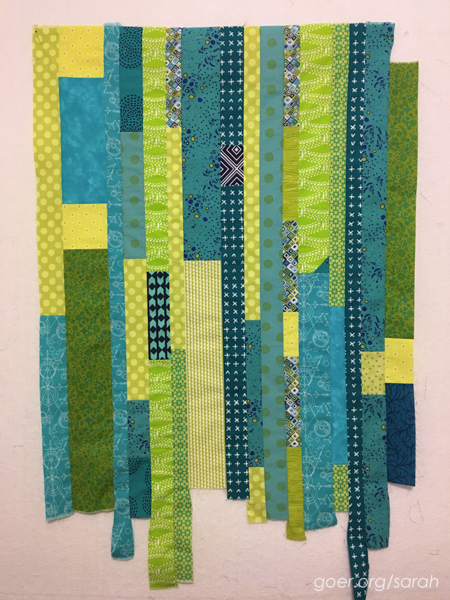 So step one was to create a new slab of scraps that would coordinate with my original scraps. I'm hoping once this slab becomes 40 more blocks and they get sprinkled throughout the quilt that it will all work out. It uses a bunch of fabrics that were used previously, with quite a few new ones. I'm worried about that green on the top of the right edge. 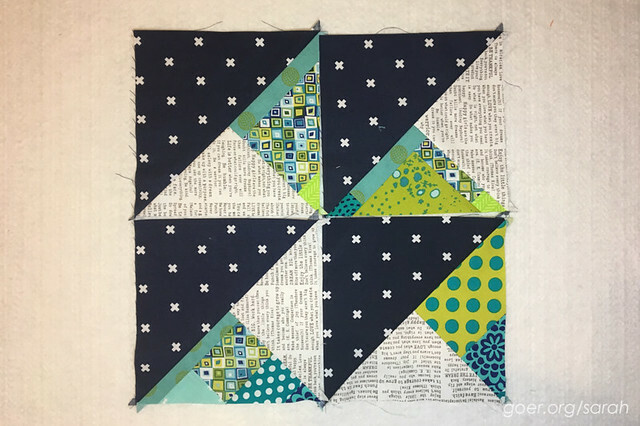 And because I really have an inability to focus on just one project, I took a break from the above project today and finished up my four blocks for this month's do. Good Stitches for Serenity Circle. They will be trimmed down a smidge to 8 1/2" by 16 1/2" each. We're using this Craftsy tutorial. They went together in less than an hour and a half total, but a couple are wonky in places. Ailish may need to starch them into submission when she puts the quilt top together. ;-) The tutorial is pretty straightforward, but I'd recommend that at the start of each seam, you offset the edge by about a half inch (see below). I only did this on the last (smallest) seams and I think it would have helped on the other seams as well. Thanks for visiting! 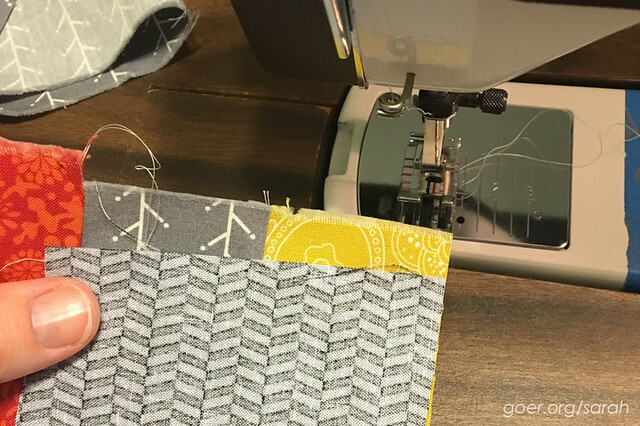 I'm linking up to Midweek Makers and Needle and Thread Thursday. Posted in Quilting. 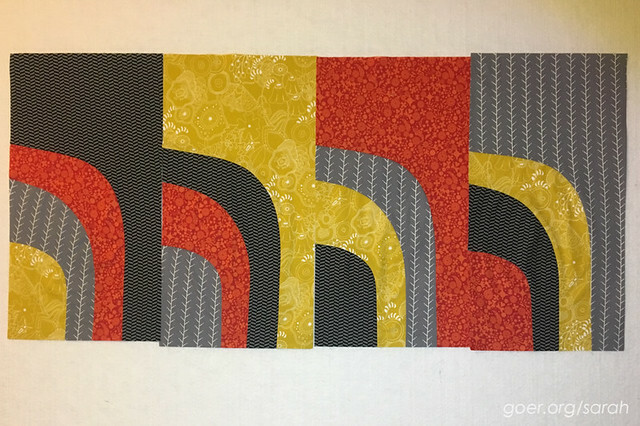 Tags: HSTs, improv, improv curves, improv piecing, WIP, WIP Wednesday on October 19, 2016 by sarah. "I just want to sew, and sew and sew". Just too cute!! Right!? Thanks for visiting, Bo! I like all the greens you used. That newsprint fabric is awesome! It all works together and will be beautiful. Swift work there on the rest of the slab/blocks! I hope to see the Little Quilter's finished Doll Quilt featured very soon. I like her ambition to 'sew and sew and sew'! Lovely projects Sarah, you have such a good eye for colour. I really like your wonky bee blocks, thank you for sharing the tutorial. Thank you, Kate. I look forward to seeing everyone's bee blocks together. Great that your daughter is finding that love of sewing whilst young . If I hadn't had a bunch of the low volume and navy squares in the box I really would have thought that I had misplaced the finished blocks. ;-) I'm having a great time sewing with the kids. I'm glad they enjoy it! Thanks for visiting, Helen! They are not. My kids sometimes attend my big traditional guild. My son may join that guild to be able to submit more than one quilt in our annual quilt show. Non-member kids (who are affiliated with a member) are allowed to submit one. Members are allowed to submit three. Thanks for the well wishes! Love your fabric choices in that block - navy has become my new favorite! Thank you, Susan. This is my favorite color palette at the moment. Navy is great! I should use it more often. I've recently gotten more great modern navy fabrics in my stash, so that will help! Beautiful work! I am abominable at curves so I tend to avoid them. Your daughter's enthusiasm is contagious; I'll have to get cracking on another project! I enjoyed my blue improv curves better than these. I'll probably make more like those. Thanks for visiting, Robin. I'd love to hear what project you're going to work on next! I hope your kids continue to love sewing with you. It is such a sweet time to share with them. Me too, Bernie! Thanks for visiting! Kudos on being productive. How nice that your daughter has a love of sewing as well.